School of Economics and Management, Northwest University of Politics and Law, Xi’an, China. 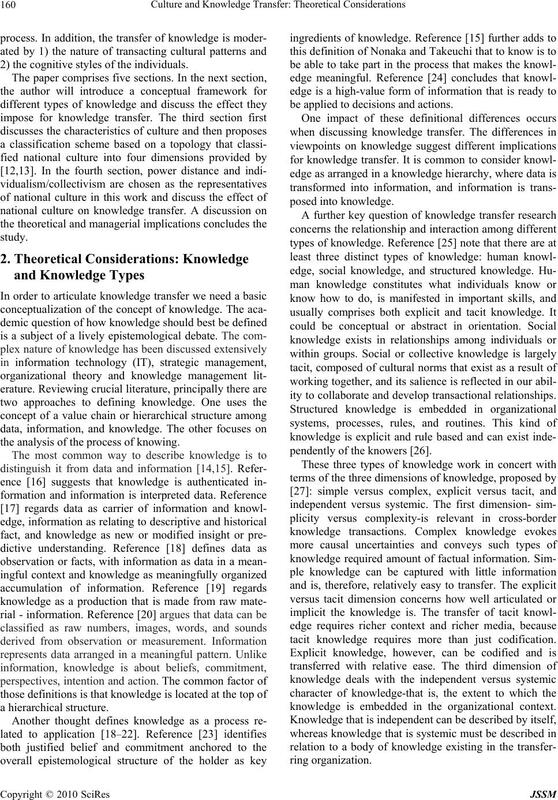 Received October 30st, 2009; revised December 19th, 2009; accepted January 27th, 2010.
per identifies the influence of different dimensions of culture on knowledge transfer in different types of knowledge. fer processes based on differences in national culture for future research. 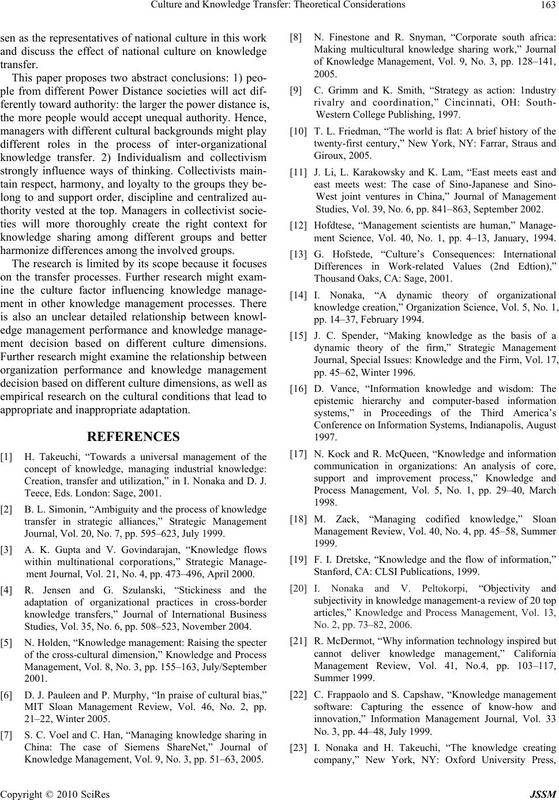 have an affect on knowledge management practices [2–4]. widely diverse national or ethnic cultural backgrounds. 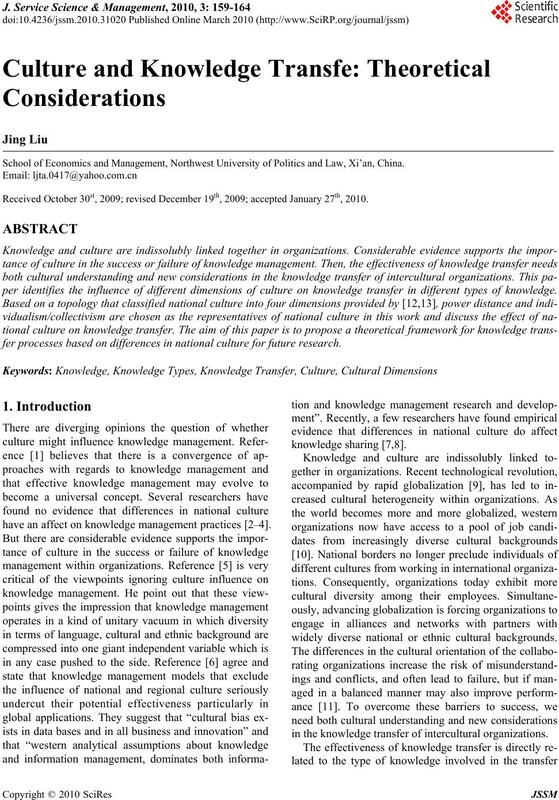 in the knowledge transfer of intercultural organizations. 2) the cognitive styles of the individu als. the analysis of the process of knowing. be applied to decisions and actions. ity to collaborate and develop tran sactional relationships. pendently of the knowers . tacit knowledge requires more than just codification. knowledge is embedded in the organizational context. tasks, in an attempt to simplify them [13–40]. see failure as common and find it easier to move on. National culture is a crucial factor in knowledge transfer. different managerial behaviors and leadership styles . culture in this work and discuss in detail in the following . in the process of inter-organizational kn owledge transfer. belong to than members of collectivist societies have. and favor cooperation and teamwork [12–45]. nize differences among the involved groups. harmonize differen ces among the involved groups. ment decision based on different culture dimensions. Creation, transfer and utilization,” in I. Nonaka and D. J.
Teece, Eds. London: Sage, 2001. Journal, Vol. 20, No. 7, pp. 595–623, July 1999.
ment Journal, Vol. 21, No. 4, pp. 473–496, April 2000. Studies, Vol. 35, No. 6, pp. 508–523, November 2004. MIT Sloan Management Review, Vol. 46, No. 2, pp. Knowledge Management, Vol. 9, No. 3, pp. 51–63, 2005. Studies, Vol. 39, No. 6, pp. 841–863, September 2002.
ment Science, Vol. 40, No. 1, pp. 4–13, January, 1994. Thousand Oaks, CA: Sage, 2001. Stanford, CA: CLSI Publications, 1999. No. 2, pp. 73–82, 2006. No. 3, pp. 44–48, July 1999. Spring, Vol. 40, No. 3, pp. 175–194, 1998. Firm, pp. 27–44, Vol. 17, Winter 1996. San Francisco, CA: Jossy-Bass Inc, 1985. Disentangling the concepts,” Organization Studies, Vol. 19, No. 3, pp. 477–492, 1998. 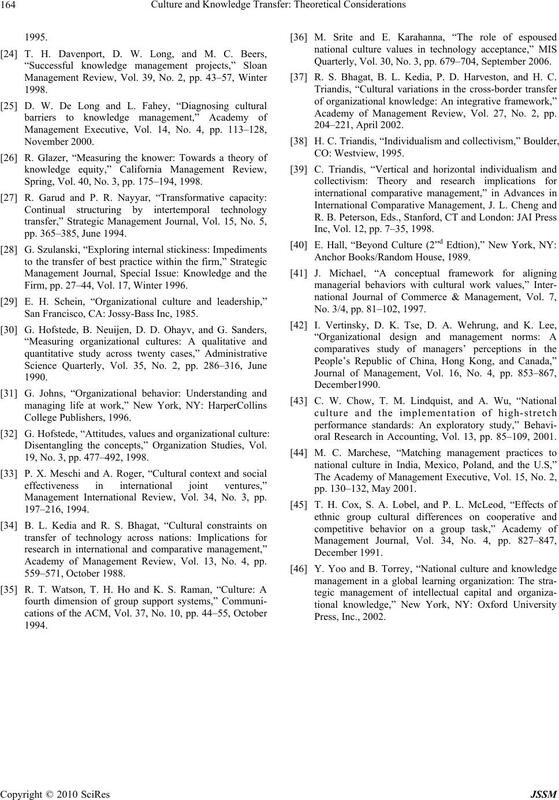 Management International Review, Vol. 34, No. 3, pp. Academy of Management Review, Vol. 13, No. 4, pp. Quarterly, Vol. 30, No. 3, pp. 679–704, September 2006. R. S. Bhagat, B. L. Kedia, P. D. Harveston, and H. C.
Academy of Management Review, Vol. 27, No. 2, pp. Inc, Vol. 12, pp. 7–35, 1998. No. 3/4, pp. 81–102, 1997.
oral Research in Accounting, Vol. 13, pp. 85–109, 2001.